Saltwater from Corpus Christi Bay will be used for cooling at the new voestalpine Texas iron processing plant, eliminating about 6 million gallons per day of demand from the region’s limited surface water supplies. voestalpine is an Austrian maker of high quality steel and related products which is investing $750 million in a new facility east of Portland on the new La Quinta Ship Channel extension. The plant will use natural gas in a direct reduction process to turn iron ore pellets into high purity iron ready to be used in making high quality steel. Matt Pastl, voestalpine’s communications chief, provided members of the San Patricio Municipal Water District board of directors with a project update at their February meeting. Using highly corrosive saltwater for cooling will require significant additional expense in plant construction. Pastl explained that the plant will use a two-stage heat exchanger system so that the bay water will pass through in a single pass before being returned to the bay. Because there is no direct cooling of process materials involved, the bay water will be discharged to the bay with no contamination. Texas Commission on Environmental Quality standards allow an increase in discharge water temperature of 4 degrees during most of the year but only 1.5 degrees during the summer. “That is very challenging but we have designed a cooling system that is 50% to 60% below that threshold. It is designed to be in compliance with both existing and future regulations. That’s very important,” Pastl said. voestalpine expects to purchase approximately 700,000 gallons per day of untreated river water from the Water District. voestalpine will tap into the district’s 42-inch line carrying blended Lake Texana-Nueces River water. The company will integrate water treatment facilities into the production plant to produce water for the primary cooling system and for process operations. Process water will be recirculated through the treatment plant for reuse. Brian Williams, Water District general manager, told board members that it has been a pleasure working with voestalpine, noting the company has been looking for water on its own in recognition of the fact that the region has a limited amount of surface water. Pastl noted that voestalpine initially evaluated the idea of bay water desalination but concluded that the challenges associated with it are very significant, particularly for a small scale desalination plant. Don Roach, Water District assistant general manager, said the district staff is extremely interested in the company’s success in using bay water for cooling and its potential use by other customers. He noted that approximately 80% of the industrial water sold by the district is used for cooling. voestalpine has a very large traditional steel making facility in the center of the city of Linz on the Danube River in Austria. The fact that there is no space for adding capacity there prompted the company to conduct a worldwide search for an expansion site. The new plant will be located on land under a 50-year lease from the Port of Corpus Christi Authority. 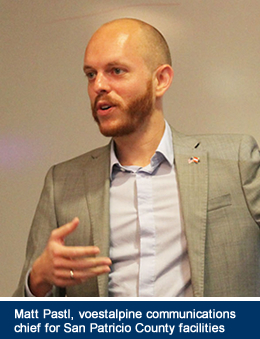 Pastl said the process will use the latest technology and elaborate emission controls. The core of the plant will be a special iron pellet reaction vessel that will be 50 feet in diameter and 420 feet tall. 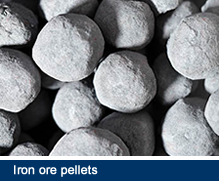 Iron ore pellets will pour into the top and spend approximately two hours flowing through the low-pressure reactor vessel where they will reach 1,300 degrees F and react with the natural gas to strip away bonded oxygen. 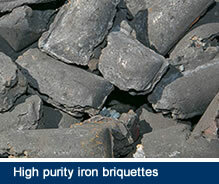 Once the material leaves the reactor vessel it will be formed into fist-size briquettes of 92% pure iron ready for the steel making process. In contrast to coke-based blast furnaces, the direct reduction plant will only use natural gas as the reducing agent, a process that produces much lower air emissions. The only byproduct of the process is iron dust which is valuable and will be collected by dust control systems and made into product. Pastl said that all conveyors, transfer towers and material handling systems will be enclosed. Material storage will be inside enclosed buildings. “We believe in long-term relationships and exemplary environmental stewardship. We intend to set the industry low emissions benchmark,” Pastl said. Read a previous post about voestalpine HERE.